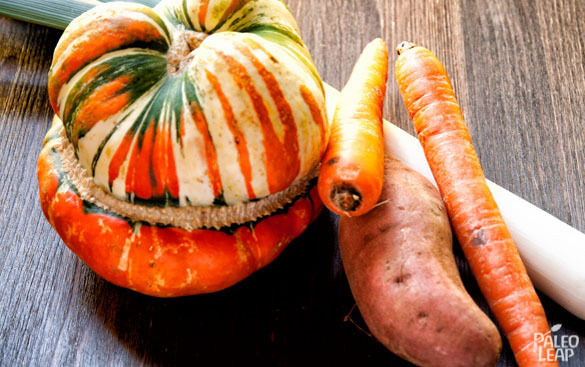 Turban squash taste just like any other squash – but what an incredible visual effect! With dramatic orange-and-white stripes topping off a brilliant red bottom layer, the turban squash itself makes a stunning “bowl” for the soup, a simple way to bring photoshoot-worthy glamor to your own table. It’s a recipe that kids are sure to appreciate, and even grown-ups can’t resist the exotic beauty of such an unusual vegetable. If you’re cooking for more than one, this can get a little tricky (since you only need one squash for the soup), but you could always just buy more than one squash and save the flesh from the extras for another recipe. 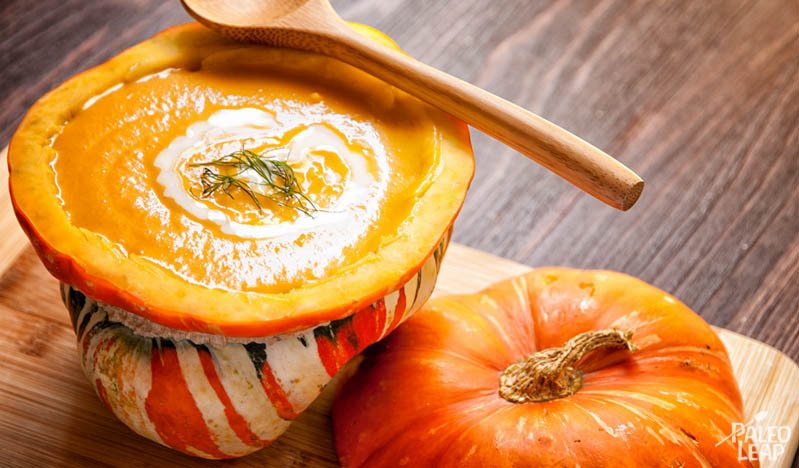 Most squash recipes are pretty flexible and they’ll turn out just fine whatever kind you use, so don’t be afraid to sub in the turban squash for butternut or another variety where you need it. As well as being beautiful to look at, this soup is also rich and creamy from the addition of coconut milk and homemade chicken stock. The other vegetables – carrots, leeks, and sweet potato – complement the flavor of the squash without overwhelming it, so the star of the show gets its chance to shine. If you’re cooking for a party or special occasion, this is a great crowd-pleaser dish, or just whip up a batch to treat yourself on a nippy afternoon. SERVES: 2 PREP: 20 min. COOK: 30 min. Remove the flesh from the squash. If you cut-off the top of the squash and then manually remove the seeds, it should then be easy to use a knife to remove most of the flesh from the squash. Melt the cooking fat in a saucepan placed over a medium heat. Add the leek, carrots, sweet potato, and the flesh of the squash, and cook for about 5 minutes. Add the chicken stock, cover, and let simmer until the vegetables are soft (about 30 min). Transfer the vegetables and broth to a blender or food processor and purée. Return to the pot and turn the heat down to low. Stir in the coconut milk and season to taste. Serve with fresh dill to garnish.